For Windows 7 Media Center (WMC) users the Xbox 360 has long been the only actively produced choice to extend the experience to multiple TVs–until the Ceton Echo Extender for Windows Media Extender (MCX) hit the market. When we first saw the Echo it was a very different device, driven by an Intel Atom based system on a chip (SoC), and subsequently a larger and hungrier device than what we have today. The form factor has changed significantly as well, to a sleek device around the size of most modern home theater “streamers,” but the functionality promised (i.e. small, quiet, efficient MCX) when used with WMC has not. This is an important point to note when examining the Echo on its own, because much of the previous coverage also included mention of Ceton’s Q (a TiVo like device) which, had it survived the summer, could have provided additional capability beyond what is possible from the standard MCX experience. With firmware releases bringing new functionality and fixes every few days it has proved difficult to nail down a definitive snapshot of the Echo’s long term capabilities; as retail availability is now upon us it is time to build on our first look and provide a current state update for the device. The only complaint with the Ceton Echo’s form factor and packaging is how difficult it is to take apart (impossible without breaking parts of it unfortunately) the chassis to peer inside. It is a well-crafted piece of extruded aluminum and plastic that feels solid with a handsome appearance that blends perfectly into the home theater stack whether in the main room or a secondary point of consumption. It was especially appreciated that the network activity lights on the Gigabit network interface controller (NIC) are not active, so it was not necessary to mask them with electrical tape to avoid annoying light pollution. The logo on the front is lit when the device is on, but at a level that was not distracting even in a darkened environment – those seeking to disable it without relying on tape will need to wait though, because the planned feature to control that is not currently implemented. The Echo MCX is passively cooled and will get slightly warm under use, but not enough that it even seemed necessary to measure it. The 3-4W of power demanded is supplied via mini-USB and a wall wart only slightly smaller than the Echo. Opting for this delivery mechanism provides significant flexibility across power standards, but the four inches of required clearance will make those behind-the-dresser plug-ins difficult. Running it off a TV with USB ports is possible (worked well with the Panasonic VT25 used in testing), though understandably not supported by Ceton because many displays do not provide 5W reliably. HDMI CEC support is planned, but did not make it into the release firmware revision this review is based on, so unfortunately a true back-of-the-TV installation remains elusive, although it is possible to use a USB WMC (eHome) infrared (IR) receiver with the Echo as long as you do not expect to power the MCX on or off via that remote. USB keyboards will also work with the Echo (three different models were tested) which makes manipulating file shares much easier; stay away from pointing devices however – they do not work (there is not a mouse pointer on screen) and executing a right-click proved a reliable way to restart the device. 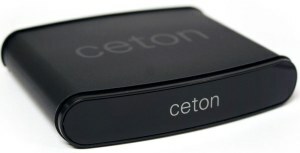 Based on its looks and size, it would be easy to group the Ceton Echo in with the myriad of over-the-top (OTT) media streamers, like the Roku 2 and AppleTV, but since the device does not currently provide access to any OTT services like Netflix or VUDU and operates only as an MCX those comparisons are not warranted, yet. Ceton recently announced that they plan to bring Android 4.0 to the Echo so that may change, but they remain tight lipped on the practical consequences (a browser is probably safe to assume) of this initiative so it is only speculation at this point. When it comes to feature set and price, the discontinued SageTV STP-HD300 (bottom) is closest to the Echo, but since WMC works very differently than SageTV, file support is much more limited. When it comes to remotes it is safe to assume that there will always be someone who is unhappy, and in this case it was me. (Editor’s note: Me too!) Where the Echo’s physical attributes ooze quality the functional RC-6 remote feels like an afterthought. The buttons are small, tactilely unrewarding, hard to actuate by feel, and the lack of lettering makes triple-tap more difficult than it should be. This is only aggravated by the inclusion of buttons that currently serve no function; although I am told that “eject” will eventually drive the front panel light toggle. That said, unless a remote is a masterpiece in execution it would not prise the universal from my hands, and for that reason the inclusion of discrete on/off buttons coupled with the assumedly minimal impact on the bill of materials (BOM) makes it difficult to complain too loudly. Opening the Echo required some destructive force, but it was worth it to denude the board and confirm that the ARM Cortex A9 based Freescale i.MX6 SoC drives the device. Decoding the part number on the chip we know that it is a dual core running at 1GHz and supports an operating temperature range of -40 to 125C. Unfortunately, I was not able to decipher the RAM SKU, so I am not sure how much memory or what type is provided. I was also unable to find a definitive list of supported codecs, but the major ones are included: AVC (H.264), VC-1, and MPEG-2. I hope to do some more digging into the specifics (e.g. profiles) at a future date, as time allows. Currently only Dolby Digital (AC-3) will bit stream, but the documentation claims support for HDMI 1.4 (which would include HD audio bit streaming), 1080p60 decode and some form of 3D video support so should they choose to enable it–Ceton is well positioned at least on the hardware side. After some more digging, I was able to find the table above listing CODEC support on Freescale’s website. It takes around 45 seconds to get from “off” to WMC when powering on the Echo, and while not as fast in navigation as an HTPC it is reasonably responsive as we can see in the video above. Like all MCX, support for WMC TV containers (DVR-MS/WTV), photos and music is good, but DVD (VIDEO_TS) will not play and other file formats (e.g. M2TS, TS, MKV, etc.) are highly dependent on the host home theater PC’s (HTPC) configuration – often requiring unfortunate compromise beyond the scope of this review. 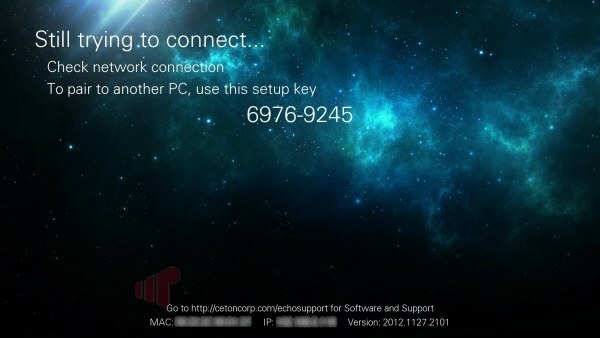 Configuration is handled through a WMC add-in that must be installed on the host PC. From there it is possible to enable bit streaming, set the video resolution (note that “Auto” currently equals 720p instead of being EDID driven), and send diagnostic information back to Ceton should the need arise. Aside from the strictly business settings, there are also a couple extras like the ability to hide navigation strips, set a default startup experience (i.e. launch straight to Live TV), and opt-in to beta firmware revisions. 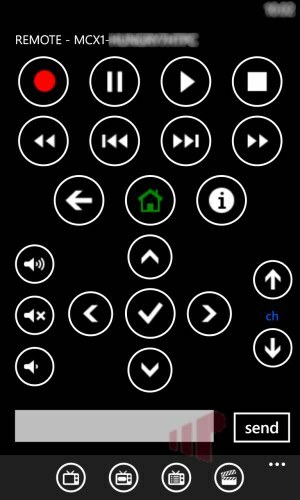 Lastly the Echo was also tested with my favorite WMC add-in (after DTB of course :)) – Ceton’s Companion for Windows Phone (shown) and Android. Happily it works great, the only niggle is that (like the PC) it is not possible to start the experience (turn on the device or launch WMC) from the app, which is a bit limiting. Unfortunately, there are several outstanding issues with the Echo. Including trouble connecting to (always resolved by restarting it) and occasional disconnection from the host PC. These issues are uncommon enough to provide only annoyance, but obviously should not occur with a “stable” firmware release. The issue where the Echo cannot reliably reconnect to the WMC host has been resolved in FW 2012.1202.1302. The treatment of video levels and lack of cadence detection is more concerning however. Currently black is clipped at 18 (anything over 16 is incorrect) which leads to a loss of detail in dark scenes, but even that is not as severe as the Echo’s inability to deal with interlaced video – which makes up a significant amount of broadcast TV content. Progressive content also suffers when scaling is performed (i.e. 720p video -> 1080p output), with jerky motion especially noticeable in sports programming. The issues with video levels have been fixed in FW build 2012.1206.1720 (currently in pre-beta testing). I’ve loaded it up and confirmed the fix, so good things are coming. Ceton just release a build (2012.1212.1449) that dramatically improves performance with interlaced (i.e. 1080i) content. Initial testing is very positive, but obviously too soon to call it completely fixed since cadence detection is still off. Either way, it’s a huge step in the right direction. As much as I like the Ceton Echo for its sleek form factor, passive cooing, low power consumption and potential, it is impossible to ignore the rushed to retail feel of the experience. When it was still beta, issues with video processing, levels and stability were excusable but now that it has reached general availability they are not. While I am confident that Ceton will address these issues in a timely way, I also worry that the current state of the Echo will tarnish their otherwise stellar reputation for customer service should the current situation linger more than a few weeks. After they are fixed, it will be difficult not to recommend it to anyone looking to extend their Windows Media Center experience to another TV – we will keep you posted. Stability issues that’s not good. Make sure to come back and check the review for updates over the next couple weeks. Hearing good things. The framerate of the UI seems a little less that ideal. Any word on if that can/will be addressed in firmware updates? I remember thinking it was a bit choppy back when I saw the CES video, I was hoping that would be fixed by release. The UI doesn’t look nearly as bad as the old Linksys media center extenders, but navigating menus on an Xbox 360 scolls/transitions nice and smooth and is nearly as responsive as the HTPC itself (except when scrubbing through video). I would imagine the hardware in the Echo can handle it, but maybe not. The 360 doesn’t follow the same set of rules that other MCX have to follow when drawing the UI so I doubt that they will be able to make it work w/ the same bling-level (it’s not a HW failing). Is lack of cadence detection responsible for the jerky video even when the echo is configured for 1080p and watching a 720p video (I’ll assume no deinterlace required)? I can’t get any video out of the box that appears smoothly with the exception of running at 720p and watching 720p. Is everyone else having the issue as well? I assume ceton is well aware of the issue? Cadence detection is only necessary for interlaced video, so it wouldn’t cause the problems with jerky playback when scaling. Ceton is aware of this issue, but I missed it originally so I updated the review to include it as well. The Video De-interlace block (VDIC) deinterlaces standard interlaced video to produce progressive video, that is used for upsizing to HD formats or for display on progressive displays. For VDIC operation three fields are necessary F(n-1),F(n),F(n+1). The F(n-1) field arrived through CSI interface in real time mode or through channel 1 and then stored in FIFO1. The F(n) arrived through channel 2. At least three lines of F(n) are stored in Line Store memory. The F(n+1) arrived through channel 3 and stored in FIFO3. FIFO controllers read data from FIFOs and then data aligned in pixels buffers. From the buffers the data arrived to Line Padding Controller (LPC). The LPC padding missing line at the beginning and end of the frame. The DeInterlacing sub-block (DI) perform theprocessing. Then data send to IC sub-block for processing or for transferring to external memory. Either they have a HW problem with this graphics block, or the SW driver needs to be improved. Sorry for the off-topic question, but in the demo video showing the Ceton interface I see what appears to be red markings for commercials along the playback scrubber when watching a recorded show. How did you achieve this? I’m using DVRMSToolbox with Comskip and haven’t found such an option. Thanks! That’s a feature of Recorded TV HD. My echo works very well when it works. Issues with EDID in my set up reveal themselves to often though. This needs to be resolved. The picture and audio quality is superb now, much better than it was in October at the start of the beta. Ceton still needs to provide a bit better stability by remembering the EDID in permanent memory I think and they also need to get better mkv support along with dts and HD Audio in all flavors. I need an extender for my bedroom. I already use the xbox 360 for for another room and it works well, but it’s noisy. Do you now recommend getting the Echo, or are there still too many issues? I just ordered it. I hope I won’t be too disappointed. You are right, I don’t have other options.